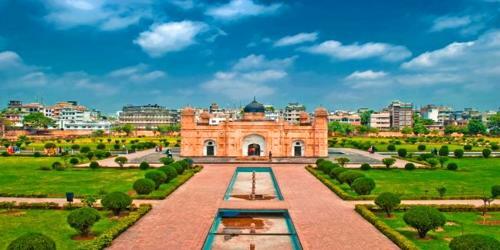 Lalbagh Fort is an incomplete Mughal palace fortress at Dhaka on the river Buriganga in the southwestern part of the old city. The river has now gone further south and flows at quite a distance from the fort. D’Oily’s painting (1809-11) shows that more than half of this east-west oblong fortress touched the water of the river on its south and southwestern sides. The Mausoleum of Pari Bibi is unusual because of its materials of construction: black basalt, white marble and encaustic tiles of various colours have been used to decorate its interior, while the central chamber, where Pari Bibi is buried, is entirely veneered in white marble. Mughal prince Muhammad Azam, third son of Aurangzeb started the work of the fort in 1678 during his vice-royalty in Bengal. He stayed in Bengal for 15 months. The fort remained incomplete when he was called away by his father Aurangzeb. 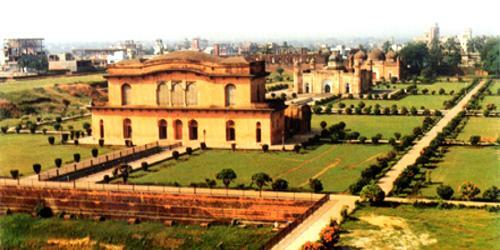 Shaista Khan was the new subahdar of Dhaka in that time, and he did not complete the fort. In 1684, the daughter of Shaista Khan named Iran Dukht Pari Bibi died there. After her death, he started to think the fort as unlucky, and left the structure incomplete. Among the three major parts of Lalbagh Fort, one is the tomb of Pari Bibi. After Shaista Khan left Dhaka, it lost its popularity. The main cause was that the capital was moved from Dhaka to Murshidabad. After the end of the royal Mughal period, the fort became abandoned. In 1844, the area acquired its name as Lalbagh replacing Aurangabad, and the fort became Lalbagh Fort. The fortification wall on the south had five bastions at regular intervals two stories in height, and the western wall had two bastions; the biggest one is near the main southern gate. The bastions had an underground tunnel. The central area of the fort is occupied by three buildings – the Diwan-i-Aam and the hammam on its east, the Mosque on the west and the Tomb of Pari Bibi in between the two – in one line, but not at equal distance. A water channel with fountains at regular intervals connects the three buildings from east to west and north to south. Three architectural monuments within the complex were finished: the Mausoleum of Pari Bibi (in front of you as you enter), the Diwan, or Hall of Audience (to your left) and the three-domed Quilla Mosque (to your right) all date from 1684. Diwani-i-Aam: Diwan-i-Aam is a two stored building. A single stored hammam is attached on its west. The hammam portion has an underground room for boiling water. A long partition wall runs along the western facade of the hammam. 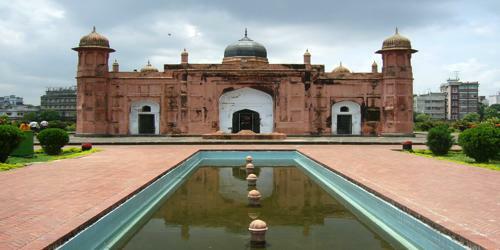 A water tank: A square shaped water tank (71.63m on each side) is placed to the east of the Diwan-i-Aam. There are four corner stairs to descend into the tank. Lalbagh Fort Mosque: The Lalbagh Fort Mosque is a three-domed mosque with a water tank on the eastern side. For long the fort was considered to be a combination of three buildings (the mosque, the tomb of Bibi Pari and the Diwan-i-Aam), two gateways and a portion of the partly damaged fortification wall. But recent excavations carried out by the Department of Archaeology of Bangladesh has revealed the existence of other structures and it is now possible to guess a more or less complete picture of the fort. In the present fort area of 18 acres, excavations have revealed remains of 26/27 structures with elaborate arrangements for water supply, sewerage, roof gardens, and fountains. Renovation work by the Archaeology Department has now put Lalbagh Fort in a much-improved shape and has now become an interesting spot for tourists and visitors.